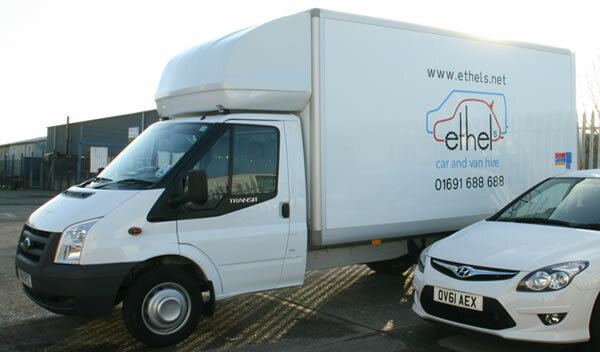 Luton Van With Tail Lift for Hire from £59 a day – Van Hire Oswestry by Ethel’s. Our Luton van provides superb flexibility for bulky items such as furniture and large boxes or crates. Although they don’t always offer quite as much length as an extra-long wheel base van, they offer greater width and huge amounts of height. Unlike panel vans, the entire load compartment is usually above the rear wheels, so the rear wheel arches don’t interfere with your load space. A Luton will have slightly poorer fuel economy and be more awkward to park, but there is no better van for fitting in everything the contents of your average sized house. This vehicle is available to for either short or long term hire, with our daily rate for hire for this vehicle as low as £55 (See our Price List for Details), which includes Comprehensive Insurance, Breakdown Cover and VAT. Please Note: The vehicle referenced above is provided as an example. Specific models within this van class may vary in availability and features such as passenger seating, luggage capacity and engine performance – See Van Hire Options for details.